well screen is made up of rods and warps. 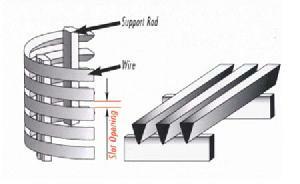 The rod can be round wire, triangular wire or wedge wire. The warp is triangular wire (or wedge wire). Water well screens have a strong structure and high open area, as well as accurate slot dimension. At the same time, water well screen have heat-resisting, anti-corrosive, good machine capability, last long, safety and reliability and so on characteristics. It can be used in many kinds of medium filtering. II. Our wedge wire screen has many advantages. � A continuous slot opening which significantly increases the available open area, thus providing a greater access to the water bearing zone. � Ladder-like wire welded screens have the features of easy backwashing, last long, safety and reliability as well as low comprehensive cost. Materials: 304, 302, 304L, 316, 316L stainless steel wire, or galvanized steel wire.